In brief: Firefox's Test Pilot program has acted as the proving grounds for a wide variety of interesting features for some time now. The latest example of this trend is 'Price Wise,' a Mozilla-made beta extension that can track price changes for products found on Amazon, Best Buy, Walmart, and other digital retailers. With Black Friday on the horizon, keeping track of the hottest tech deals across the web can be a challenging prospect. We do our best to keep you up-to-date on some of the better offers with our regular Deals posts, but those can only cover so much ground. That's where Firefox comes in, if browser developer Mozilla has its way. 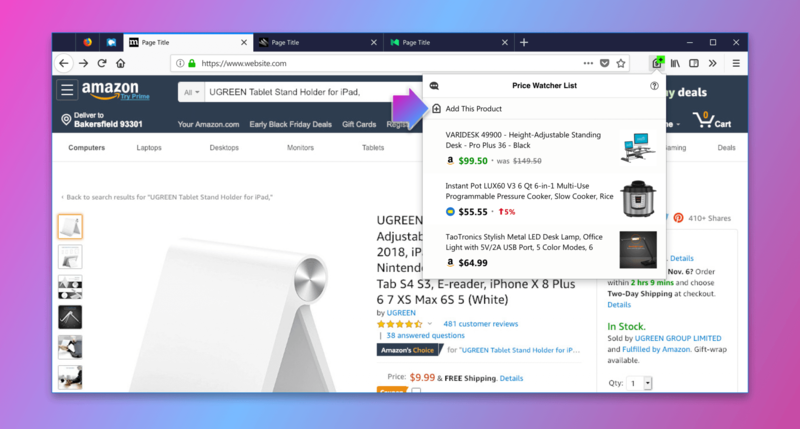 As part of the company's "Test Pilot" beta program, users will now be able to test the "Price Wise" Firefox extension. Price Wise can track price changes for any products you choose across five major digital retailers: Walmart, Amazon, eBay, Best Buy, and The Home Depot, specifically. Mozilla chose these specific websites because they were "among the top 10" online shops visited by Firefox users. Mozilla's latest extension isn't complicated to use. All you need to do is visit the page of a product you want to track, click the "Price Wise" icon in the top-right corner of Firefox, and select "Add This Product." All products you do this to will be added to a simple list, which includes a thumbnail of the item, its current price, and a colored percentage indicating whether the price has risen or lowered. If this functionality sounds like your cup of tea, snagging Price Wise is as easy as signing up for the Test Pilot program and downloading the extension. However, as useful as Price Wise sounds, it's important to note that it's only a beta feature at the moment. As such, it could be heavily tweaked or scrapped entirely down the line.